Anyway, I've been thinking a lot lately about how I can add even more ridiculous aspirations to my portfolio of unrealistic dreams. Why stop at scriptwriting large adventure films that will likely never get made? Why not explore every facet of my deepest literary desires? That way I'll have even more to be justifiably bitter about when I'm old. 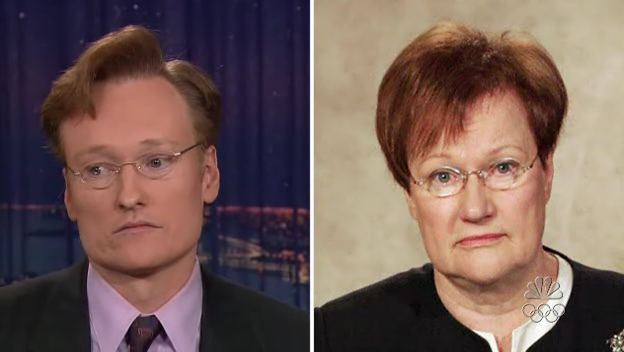 So of course, I need to add writing for the Conan O'Brien show to my list. I'd be the ultimate failure at writing for Conan for a plethora of reasons, but I will only acquaint you with a few. For one thing, my jokes would be too obscure. Obscure jokes are just a way for nerds to hide their insecurities, so they can have a reason to laugh at someone else for a change. As in, "What? You don't get it?" Point, laugh... And I don't think tv shows are going for the antagonistic vibe right now. Last night, the only idea I could come up with for a Conan skit on the spot was about a man who uses pick up lines on women from Digital Underground songs. As in, "Hey fat girl, come here, are you ticklish?" And so on and so forth. That's right. A 20 year old joke. It took me my entire life to come up with that one. So obscurity and timeliness would definitely hinder me. And they'd never let me on the show. I'd desperately try to claw my way onscreen, again, for the attention. But I'm rotten at impressions. For example, regarding the aforementioned 20 year old joke, my version of the lead singer of the Digital Underground sounds like the Sugar Smacks frog. Because I may not be textbook funny now, but I AM always willing to make a fool of myself. And that's got to count for something.